Photo: Governor Simeon M. Athy, Reserve Bank of Vanuatu at the AFI Public-Private Dialogue (PPD) High-Level Roundtable in Washington D.C.
Cybersecurity poses a real threat to financial inclusion with digital innovations designed to reach the unserved and unbanked potentially exposing users to new types of risks, speakers said on 11 April at Alliance for Financial Inclusion (AFI) Public-Private Dialogue (PPD) High-Level Roundtable in Washington D.C.
Over 50 representatives from AFI member institutions and PPD partners attended the high-level event aimed at exploring cybersecurity risks to financial inclusion as well as effective responses and mitigating policies. 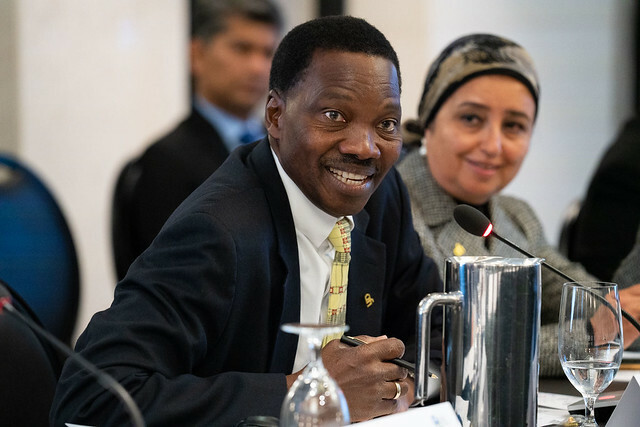 “It’s important to address these issues within the PPD, which provides such a diversity of experiences and specialties,” AFI Executive Director Dr. Alfred Hannig said. Cybersecurity tests the fundamental principles of information and security management amid the global shift towards digital economies, and its risks can be effectively reduced through systematic collaboration and knowledge sharing. To help prepare its members for the potential challenges ahead, AFI is developing a Financial Inclusion Cybersecurity Risk Guide under DFSWG’s cybersecurity subgroup. Headed by Central Bank of Armenia’s Komitas Stepanyan, the guide aims to accelerate mitigation and enhance the understanding of supervisory bodies on emerging technologies and their potential threats. “The question is how to plan … how central banks can deal with [cybersecurity], because it’s really a worldwide issue,” he said, during a presentation on the subgroup’s progress and next steps. Reinforcing these efforts, Dr. Hannig said it is imperative that the public and private sectors – not only from developing countries, but together with developed countries – deepen their collaboration efforts. Cybersecurity and Identity Consultant Paul Makin added that “there’s a huge set of technologies that we know are directly relevant to financial inclusion and have their own particular vulnerability relating to the classic financial inclusion customer,” citing mobile phone usage and blockchain technology. According to Juniper Research, worldwide online payment fraud reached USD 22 billion in 2018, and financial inclusion services will contribute an increasing proportion over the coming years as more of the unbanked gain access to formal financial services and attackers seek potentially easy targets. “We only need a large-scale breach in one of the large services and confidence in these services will fall overnight,” said Makin, who has been working alongside AFI’s digital financial services working group (DFSWG) to develop the cybersecurity risk guide. Emphasizing the fundamental role private sector partners play in supporting their public sector peers, AFI’s Hannig said that they can offer expertise and “real world insights for regulators who often don’t have access to these insights”. “Cybersecurity is also an issue that neither side can successfully address on their own,” he added. Discussions at the event aimed at extending the foresight of AFI leaders towards newer technologies and related cybersecurity risk management while enhancing cybersecurity policy responses with insights from public and private perspectives. The High-Level AFI-PPD Roundtable was designed to establish long-term collaboration between public and private sector partners to effectively address cybersecurity risks in support of sustainable and resilient financial systems in AFI member institutions and their countries. Held each year during the IMF/World Bank Spring Meetings in the US capital, it was implemented in collaboration with AFI’s PPD partners, including Visa, Mastercard, Thunes and GSMA. It was funded through the AFI’s Multi-Donor Financial Inclusion Policy Implementation Facility (MD-PIF), which is supported by the French Development Agency (AFD), the German Federal Ministry of Economic Cooperation and Development (BMZ) and the Ministry of Finance of the Grand Duchy of Luxembourg.